Sophomore Te'ja Twitty drives to the hoop against a Tusculum defender. 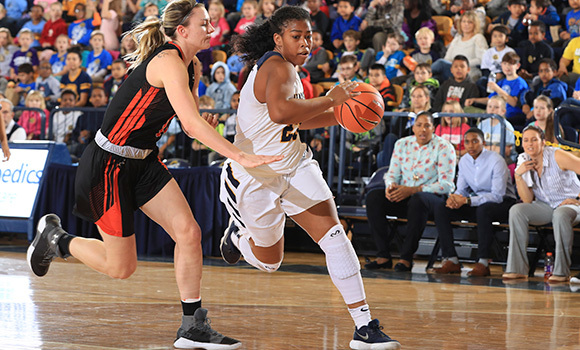 UNCG women’s basketball is bursting at the seams with potential. The group is the youngest squad in Division I women’s basketball – 12 of the 14 student-athletes are first- or second-year students. They’re young, and they’re talented. They’ve been challenged to step out of their comfort zones and emerge as leaders. Just ask sophomore Alexis Pitchford. Last year, with six seniors leading the way, the Spartans had a historic season: 20 wins, a postseason run and three players with all-conference nods. Head Coach Trina Patterson, in her first year at UNCG, was named Southern Conference Coach of the Year. Despite their youth, the Spartans are working toward replicating that kind of success this year. “I want to keep winning. We want to reestablish a winning tradition here,” Twitty said. To do that, Patterson is cultivating a culture that emphasizes hard work and enthusiasm. “We defend. We rebound. We run. We execute. Those are four fundamental aspects of our basketball,” she said. Patterson is dogged when it comes to success on the court. But she takes success off the court even more seriously. She understands that her role is more than coaching – it’s counseling young women. The Spartans kick off home SoCon play this Thursday, facing Wofford at 7 p.m. in Fleming Gym. The first 300 fans in attendance will receive a free UNCG tote bag as part of “Ladies’ Night,” and other giveaway drawings will take place throughout the night. On Saturday, the team will compete against Furman at 4 p.m. in Fleming Gym. For more information and to purchase tickets, visit uncgspartans.com. Stay up-to-date with women’s basketball by following UNCG Athletics on Facebook and Twitter.